Orange is the colour of joy and vitality; the perfect shade for surprising a loved one with a bright and beautiful bunch of flowers. ArenaFlowers specialise in sending quality blooms, hand tied by their own florists, and can deliver gorgeous orange flower bouquets for every occasion. For a special birthday celebration, vibrant orange gerberas look amazing teamed with hot pink varieties of the same stems, especially when they’re wrapped up in perfectly arranged foliage ready for displaying. Part of the appeal of gerberas is that they reflect the simple elegance of a daisy, making them a modern and bold choice. For green fingered friends and family, sunflowers make a surprisingly welcome floral display. ArenaFlowers delivers designs that incorporate these stunning blooms with wonderfully scented freesias and roses to ensure that the gift smells as good as it looks. Sunflowers are a summer flower, which makes them ideal for the end of year teacher’s gift, where a fabulous bunch of flowers delivered at the beginning of the last week of school will brighten up any classroom. 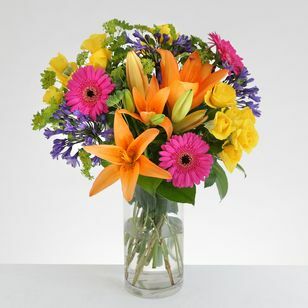 Being such a positive and warming colour, orange flowers are perfect for surprising somebody who might need cheering up. For anybody who’s endured the stress of moving into a new home a stunning arrangement of gladioli stems and lilies will manage to stand out in a room surrounded by the obligatory brown moving boxes. 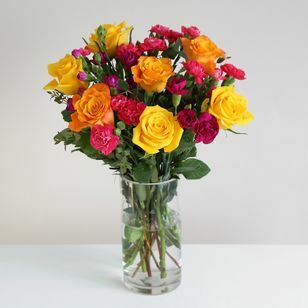 Likewise for somebody who’s feeling unwell, a deluxe bouquet of orange, red and yellow roses will brighten up the plainest mantelpiece, and a gift vase can even be sent at the same time so that the recipient doesn’t have to hunt around in the cupboards to find one. Flowers have been proven to have an uplifting effect on moods and simply having a beautiful display around the home will lift anybody’s spirit. As the colour associated with sunshine and summer orange is the ideal hue for any occasion, especially where it’s a celebration or an event where spirits need lifting. Because they are so bright and bold orange flowers are fantastic for livening up any home, even if it’s not a particularly extraordinary day, and perching a gorgeous selection on the mantelpiece will bring the sunshine indoors.